The 1,250 plus partici pants in the US Lacrosse Women’s National Tournament were given the option to watch the NCAA Semifinal and Championship games which took place at Towson University this past weekend. The players also competed in two full days of pool and bracket competition. 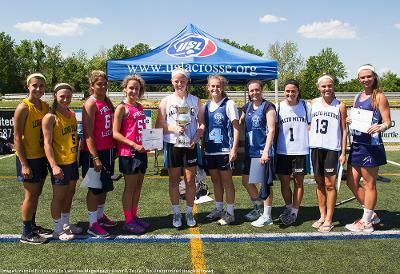 After the Schoolgirls Championship game for the Onondaga Division, the Val Walchak Trophy was presented to the Long Island Metro 1 winning team. The prestigious Heather Leigh Albert Award for most outstanding player was also presented to Olivia Jenner (Baltimore Metro 1) from McDonogh School. Over the years, the National Tournament has grown, not only, in participants, but also, in the areas its players represent. This year’s tournament boasted players from 29 states with division champions from New York, Illinois/Wisconsin, California, Virginia, Oregon and Florida. What makes this event different from other lacrosse tournaments is the tryout process. In order to participate in the tournament, athletes must try out for regional teams. The girls are brought out of their comfort zone since they aren’t playing with their usual club teams. This gives college coaches from all levels the opportunity to see how well these players can adjust to new environments. For participants, they are given the opportunity to show coaches their abilities in a higher level of play. Another unique aspect of this year’s tournament is that it also served as an evaluation period for the US Under-19 coaching staff. The US Lacrosse Women’s National Tournament also acts as the first round of tryouts for the 2015 U.S. Women’s National Under-19 Team. The Federation of International Lacrosse (FIL) Women’s Under-19 National Championship has been held every four years since 1995. The U.S. Team has won all but one of these championships. The national scope of this event adds to the buzz that surrounds it. The incredible turnout at the National Tournament was only helped by the great weather experienced over the weekend. Overall, US Lacrosse succeeded in its goal to create a first-class experience for its members through the Women’s National Tournament. The organization strives for the promotion of lacrosse and what better way to highlight the sport and its growth than through its high school division! After all, many of these talented players may one day find themselves with a NCAA Championship Title of their own.